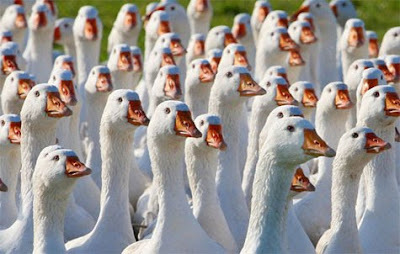 A flock of geese walks across a field in Kuhhorst, Germany. Must've been an even, better 'unrecorded' version before this perfection was attained. I think I even heard a duck. I'm still trying to figure out what happened to all the 'gas money,' when it was more than four-bucks a 'jigger' (reminds me of a 'bug' but really was 'that much' per gallon) and then I was thinkin' 'bout 9/11...since I'm watching PBS. Some don't need to read, just eat.